Ashcroft care home in Undercliffe has been rated outstanding in the caring category by inspectors from regulator the Care Quality Commission (CQC). Staff at Anchor’s Ashcroft in Kelvin Way were celebrating this week after receiving an overall good rating from the CQC with the category on being caring receiving top marks. 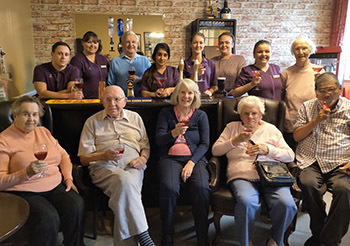 The home, which cares for up to 66 residents, was praised by the CQC in the recent inspection which took place on 17 and 26 April this year. Care homes are now classed as either outstanding, good, requiring improvement or inadequate. Home Manager Emma Ciccone said everyone at the home was thrilled because they had worked so hard to maintain high standards of care. She said: “We have worked hard to make Ashcroft a good care home but to be given such praise from the regulator is wonderful. We are proud of the meals which are made from fresh seasonal ingredients and the high levels of training and support our staff receive. The CQC inspection report, which can be found on the regulator’s website, highlighted the following examples of high standards of care at Ashcroft: ‘Respect for privacy and dignity was at the heart of the service's culture and values’; and ‘people were treated with kindness, respect and compassion’. ‘Without exception, people told us (the inspectors) that Ashcroft is a good home. Comments from residents included: "I think it's very nice here. It is comfortable. It is a well-run home and I would recommend it to people"’. The inspectors said in their report that the care given to a relative of a resident was exemplary and “heart-warming”. The relative said: “The attention to detail is obvious, plus my spirits are always lifted after a visit, mostly due to the staff. I feel welcomed as a member of the Ashcroft family and for that I am truly grateful." For more information on Ashcroft care home, please call on 0800 085 4292.